The Nokia N810 isn't really a phone. It's a Linux-based Internet tablet with wireless connection options—and you can write and run Java applications with it. If you follow my Dr. Dobb's Java blog (www.ddj.com/java), you know that I'm both a fan of Apple products and disappointed with Apple, mainly because Apple doesn't support Java on the iPhone. This led me on a search for a device that could run Java, connect wirelessly to the Internet from anywhere, and let me make voice-over-IP (VoIP) phone calls without a cell phone carrier. I haven't exactly found this device yet, but I've come closereal closewith the Nokia N810 Internet Tablet. While Nokia considers the N810 as a phone, it really isn't a phone. It's a Linux-based Internet tablet device with wireless connection options, including 802.11b/g, Bluetooth, and WiMax. And with the help of some readily available software, you can run Java applications and make VoIP-based calls on the device, among many other things. 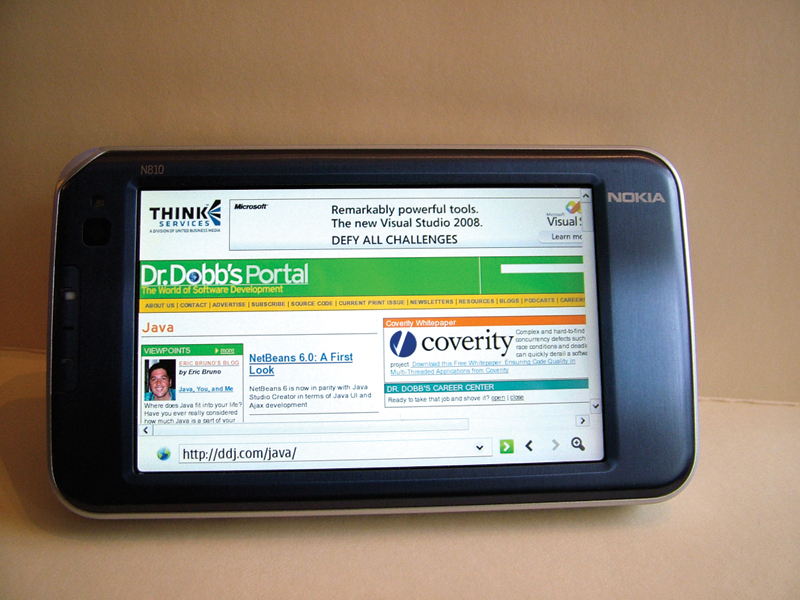 With its 800×480 display and Mozilla-based Ajax-capable browser, the N810 delivers full desktop-quality web browsing (Figure 1) similar to the iPhone, but not a scaled down mobile version like with other cell phones. The N810 comes with software to record/playback video streams, play music and movies with stereo output, and do everything you can do from a desktop Linux system in terms of multimedia. It also comes with map software and data, integrated with the device's GPS receiver, to show your location in real-time with directions to where you want to go. With an available software upgrade, it becomes a complete turn-by-turn navigation system. In terms of communication, you can install Gizmo, GoogleTalk, and Skype. There's also IMAP4/SMTP/POP3 support for web-based e-mail systems such as GoogleMail and Yahoo!, with software that provides alerts as new messages arrive. Of course, being Linux-based, there are all kinds of software add-ons available (free and for fee) to add more media, entertainment, and productivity features to the N810. Figure 1: Websites are displayed in full desktop mode, not as scaled down mobile pages. Skype is a service that lets you make voice-over IP (VoIP) phone calls via the Internet from a computer with Skype software installed. It also comes with an instant messenger interface, letting you text or call the people on your contact list. Skype offers client software for Windows, Linux, Mac OS X, and mobile devices such as cell phones and the Nokia N810 (see skype.com/download/skype/nokia). Skype calls are routed to whichever computer you're currently running the Skype client on. This can be a desktop, a laptop when traveling, or a mobile device like the N810. All that's required is an Internet connection, and people can use your Skype name or phone number to reach you, no matter where you are.